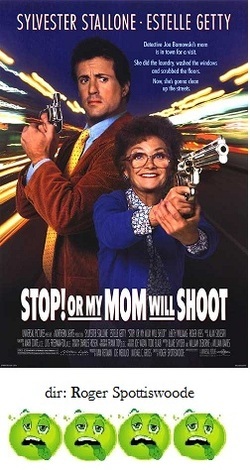 At some point, someone pitched the idea of pairing up tough guy Sylvester Stallone with diminutive Golden Girl Estelle Getty as a mother and son comedic duo. The comic inspiration ended right there and Stop! Or My Mom Will Shoot was coughed up in order to fleece movie-goers of their valuable time and money. Yes, Stallone is a cop. Yes, Getty is his mother. And if you think the very idea of this is of the utmost hilarity, then more power to you because at least you'll find something to laugh about. Not so for anyone else. Plot? What plot? Oh sure, there's a very perfunctory story about some bumbling, idiot criminals; you know, the kind of stupified criminals that only exist in movies like this, the kind that you can't understand how they can function without swallowing their own tongues let alone engage in a gun-running syndicate, but there you go. While out buying Stallone an uzi, Getty witnesses a murder and it's up to them to stop these bad guys. But this is the barest of clotheslines to hang the essential thrust of Stop! Or My Mom Will Shoot which is the very unfunny bickering Stallone and Getty get into. Getty continually embarrases Stallone by showing baby photos to anyone who will look, telling humiliating stories and continually upending Stallone's professional and personal life. Stallone's response to all of this is to whine, "Mooooooommm!" like a petulant 4 year-old. Why do movies like this even get made? Why do audiences continue to go to them? These are questions to which there are no easy answers. The material here is on the level with the very blandest of television sit-coms. In fact, if this story were boiled down to a 30 minute sit-com pilot (which wouldn't be very hard to do), it probably would be soundly rejected by all of the networks. Maybe if the movie were filmed with a pre-existing laugh track it would be more enjoyable; after all, there's no excitement, comedy, believability or creative to be found, so the film makers may as well have owned up to what kind of movie they were making. Stop! Or My Mom Will Shoot is just a dire excuse for a major motion picture release. It's a piece of disposable junk that only managed to further send Stallone's career into a death spiral from which it never fully recovered. It's best to just avoid this movie and save the valuable space in your memory banks.